From vintage textiles to Moroccan pillows, poufs, rugs, and more, we feature sustainable home decor and accents designed to infuse comfort and happiness into your home, crafted from carefully sourced and upcycled textiles from across the world. Welcome to House of Cindy, a place where beauty and elevated design has met environmental stewardship. We are inspired by a California lifestyle with a reverence for natural beauty. Our products are created and selected to elevate your aliveness, many items are made one at a time, with hand and heart, in our Los Angeles design studio. It is our intention that you fall in love with your home and carry that feeling into your everyday living, where you reside in the pleasure of happiness, eco-integrity and timeless comfort. 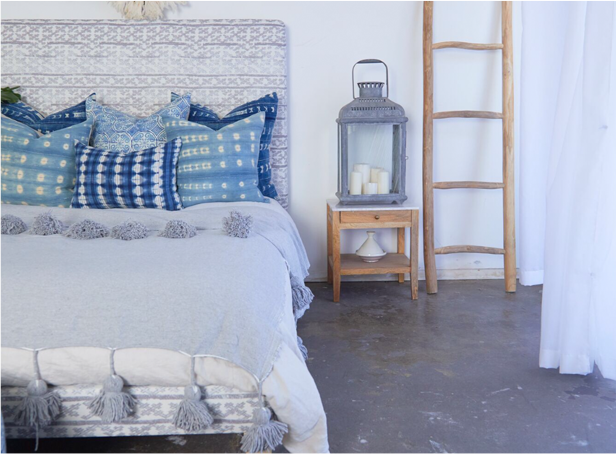 Our vibrant range of eco-conscious decor includes authentic Moroccan pillows, bohemian-style poufs from LA, vintage-style Moroccan Berber and Beni rugs, Bohemian mirrors and sustainably printed eco textiles, and so much more. Imagine a soft, fluffy rug as an eye-catching centerpiece for your living space, or a plush floor pouf when you’re ready to put your feet up for the day. We love these finishing touches that infuse a home with warmth and personality. When you adorn your home with poufs, Moroccan pillows, throw pillows, pom pom blankets, and unique sustainable textiles, you know that you are investing in human-scale creativity and environmental responsibility while discovering timeless home decor. Everything we do at House of Cindy is about living with integrity—an exciting journey that we invite you to take along with us. Many of our products use hand-painted designs and artisan finishes, so you can fall in love with each item knowing that it’s one-of-a-kind and infused with artful details. We aim to help you discover the designer within, as you channel your love for comfortable, inviting home decor and global styles. Browse our range of rugs, accessories, and Moroccan pillows and fall in love with countless eclectic styles and textures.